The doomsday clock has ticked 30 seconds closer to midnight since the mishap with the accidental missile alert in Hawaii earlier this month. This sets the clock at 2 minutes to midnight and has everyone at the edge of their seats. The clock dates back to 1947 when scientists wanted to create a mechanism that could warn the public of escalating global tensions. The scientists that created the clock were the same scientists involved in the Manhattan Project, which was a research and development project to create nuclear weapons during World War II. The clock is a symbol of dread, but also symbolizes hope. Is our civilization ever going to be safe? The clock started at seven minutes to midnight and has had over two dozen changes since being established. The clock peaked in 1991 after the Cold War “peacetime” had it standing at 17 minutes to midnight. So what makes this clock tick? Let’s explore notable world events over the past several years and how they have impacted the doomsday clock. ​It didn’t take long for the clock to tick forward as the Cold War started heating up and the race to obtain nuclear arms began. The clock was set at 11:57 in 1949 when the Soviet Union began testing atomic bombs. This is when the clock was moved and the public was warned that we were two minutes from doom. The hands of the clock were moved back to twelve minutes from midnight in 1963 and we seemed to be in the clear. The clock ticked forward from twelve minutes to midnight to seven minutes when the U.S. got involved in the Vietnam War. As the war continued, the clock seesawed back and forth, but in 1974 the clock was set back to nine minutes to midnight. The 80’s ushered in some of the tensest moments in the Cold War. The clock was moved to three minutes to midnight because of the stalled communication between the U.S. and the Soviet Union. The hand was rolled back a minute after the Intermediate-Range Nuclear Forces Treaty was signed in 1988. The Cold War ended in 1991 and there was a sense of peace throughout the world. The clock was set to seventeen minutes to midnight and this was the farthest the clock had been from midnight since 1963 when the clock was set to twelve minutes to midnight. 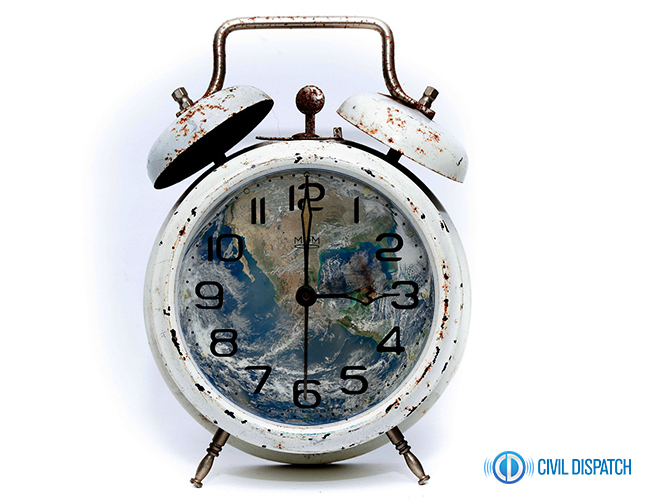 The doomsday clock was turned back to the furthest point from midnight in history, but that didn’t last long when the 2000’s brought in the “new nuclear age.” The clock was moved to 3 minutes until midnight in 2015, thanks to climate change and the increase in nuclear weapons. The clock has faced a lot of criticism since it began. Some critics have questioned the usefulness of the clock saying that it creates a sense of urgency and panic among the public; and others say that the clock shouldn’t even be taken seriously at all. It’s important to remember that the clock isn’t completely accurate and is just a symbol of global threats. If you haven’t already, sign up for text messages from Civil Dispatch to get up-to-date information on threats in your area!